Difference between revisions of "2019 Events"
* Nov 1st, midnight: Start Writing! * Nov 30th, 11:59 PM -- Stop Writing! Scroll down the page to see event details. 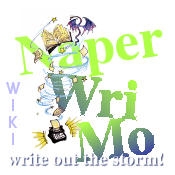 Welcome to the events page for NaperWriMo, the USA::Illinois::Naperville region of National Novel Writing Month. Location: see location maps Be sure to bookmark http://naperwrimo.org/events that will always point to the latest Events page. This year will be the sixth Library Crawl (following 2014, 2015, 2016, 2017, and 2018). Don't know what a write-in is? See All About Write-ins. Nov 1st, midnight: Start Writing! Nov 30th, 11:59 PM -- Stop Writing! See the information on our Slack-based regional chatroom. This page was last modified on 7 February 2019, at 10:33.